Welcome to Fr Behruz Rafat: Like Fr Christopher, Fr Behruz spent his earliest years in Iran being baptised in the Dominican Church of St Abraham’s (one of whose priests became Archbishop and ordained Fr Christopher in Wimbledon). Later back here in England, he attended Bishop Thomas Grant School. After Hull University he trained for the priesthood at St John’s Seminary, Wonersh. He is currently resident in Corpus Christi, Tonbridge helping the run three Churches with Fr Peter Murphy who was a young Legion of Mary member with our own Fr Hugh Thwaites SJ. Fr Behruz used to live in nearby Norbury where his grandparents, the Mackesy’s were pillars of St Bart’s. Vespers & Benediction: Sundays 5pm during Advent. Come and experience this beautiful combination of the Psalms of David & the ancient chants of the Church which go back to the Synagogue. Bazaar Totals: As the Latin American meal will not be held until next Saturday, we have not yet had the total. We banked just under £8000. 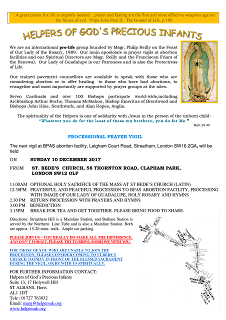 Parish Catechises Presentation: This coming Friday (15th December) in the club at 8pm. Fr Przemek plans to show us the beautiful panoramic programme on “Catholicism” by Fr Robert Barron. All over the world this attractive series has been translated into scores of different languages and has become universally popular. Think about coming and trying out this series. It is a way to enlarge our mind and heart. It is a way to increase our knowledge and understanding of the Good News of Jesus Christ which sets us free and gives us a huge reason to live and love with energy. So many of us get caught up in the forest of routine and pressure that we cannot see the wood for the trees and rarely have time to even think (let alone discuss) the amazing reasons for our existence. Too busy? Surely not too busy to live and have a life? What about “the life which is life indeed.” Make time this coming Friday and step out of that boring routine and try it out! Altar Servers: The Senior Servers will meet on Saturday 16th December 10-12noon. FHC Programme 2018: Our first ‘kick-off’ meeting for parents and candidates will be next Sunday at the 9.30am Mass followed by a brief meeting in the Presbytery. Letters will be going out to all those who have completed their applications form recently. Confirmation Application Forms: Pick your form up from Fr Chris this weekend. You must be in Yr. 8 or above. Goodbye to Fr Martin Thompson who will leave us tomorrow before flying back to Albania on Friday. Christmas Carol Service: with children of St Bede’s on Monday 18th December 4-5pm. This ends with Benediction. The Laurels School Advent Event: Wednesday 13th December 7pm here at St Bede’s. All are welcome!! Today: Helpers of God's Precious Infants: at BPAS Abortion facility on Leigham Court Road will take place on Sunday 10th December leaving from St Bede’s after the 11am Mass (approx 12.30pm). See the poster at the back of Church for more info. 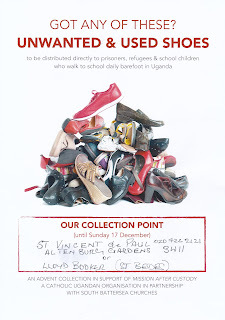 Unwanted & Used Shoe Collection: Sunday 17th December. See poster at the back of Church for more information. 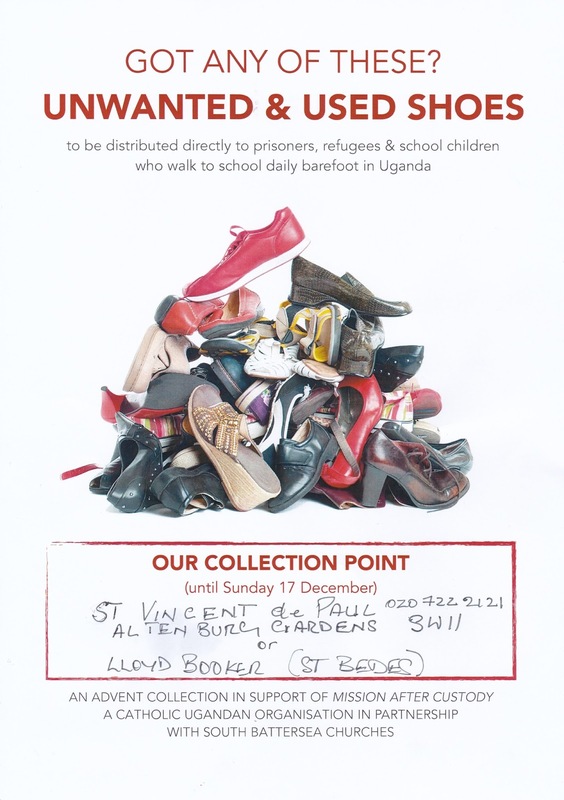 Shoes can be donated at the collection point given or contact Lloyd Booker.